The Deluxe 6 Inch Blue Microfiber Bonnet turns your DA polisher into a wax removal machine. These bonnets are made from premium microfiber that is soft and gentle to the paint. The soft microfiber material is made up of tiny looped fibers, each 100s of times smaller than a human hair. This gives the Deluxe Blue Microfiber Bonnet the ability to remove car waxes and residues extremely easy. Simply fit the Deluxe 6 Inch Blue Microfiber Bonnet over a 5.5 or 6.5 inch pad and attach to your DA polisher. Using a moderate speed (3-4) and moderate pressure, the Deluxe Blue Microfiber Bonnet will make removing residue a breeze. Take the labor out of buffing. When one side of the absorbent bonnet becomes caked with residue, simply fold it inside out and put it back on. Deluxe 6 Inch Blue Microfiber Bonnets are machine washable and reusable. 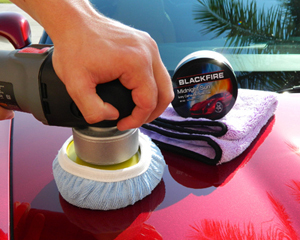 When both sides are loaded, machine wash the bonnet using BLACKFIRE Microfiber Cleaner and Restorer with your other microfiber products. Air dry or dry on low heat. The Deluxe 6 Inch Blue Microfiber Bonnet is also available in orange or green to avoid cross contamination. 2 Pack.